So it looks as if the UK will definitely be leaving the EU ….sometime. This historic moment has prompted me think about what our ‘national vegetable’ might be in these turbulent times. And being as the times are so turbulent, what the constituent national vegetables of the nations in the British Isles might be, as we go our separate ways. Lets start with the easy one; Wales. They already have a national vegetable, the leek. A good choice, so easy to grow, tasty, versatile and nutritious. But officially.. no other nation has such a vegetable. So here goes with some suggestions. Scotland. The national dish, haggis, is normally eaten with ‘neeps and tatties’. Far from being turnips, ‘neeps’ are actually swedes. Understandably popular on Burns Night which falls in January when there isn’t a lot else around – but hardly a vegetable to set the heart racing. How about a variation on the national flower, the thistle? The cardoon perhaps? or the artichoke? Looks much better on the menu of a swish Edinburgh eatery. Ireland? The obvious suggestion is the potato and indeed there a is even a ‘Tayto’ theme park in the Republic and the internet swirls with articles of the ‘Thirteen reasons why the potato is the Irish national vegetable’ – variety. But the potato is a staple, and redolent with the suffering of the Famine of the 1840’s. Hardly something to celebrate. How about the garden pea? There are some good Irish-sounding varieties like the Danny O’Rourke. And it is popular in Ireland. For the traditionalist perhaps caragheen, gathered from the seashore and popular in seafood restaurants might command support? The cabbage too has its supporters. After all colcannon or ‘champ’ made with cabbage and potato and often eaten with sausages, is a classic Irish dish, north and south. Would the North have its own? Hmmm… Didn’t someone once say ‘oranges are not the only vegetable’, or something like that. Lets move on. England. 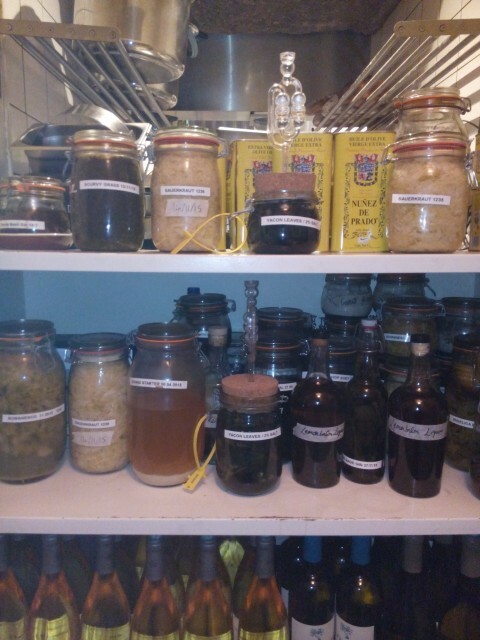 So many vegetables, so many contenders. From the root vegetable world, lets hear it for the carrot, and the parsnip. Such classics of English cuisine. For the more advanced palate the asparagus perhaps? A reminder of Spring, ready from St George’s Day. But perhaps that is its problem; too seasonal. Of course the English regions are asserting themselves these days too. So how about the ‘national’ vegetable of Yorkshire. Rhubarb obviously. Yorkshire, home of the ‘rhubarb triangle’. Most people think it is fruit, but it isn’t. Isle of Wight? Not independent yet, but who knows. Home of England’s only garlic festival, it has to be garlic. But who wears the crown of being England’s truly national vegetable? Something we have as part of the traditional Christmas dinner perhaps. Maybe the roast potato, but the potato is too closely associated with Ireland to really work; parsnip is definitely a contender, but what else graces the Christmas platter? Why the brussels sprout of course. Step forward…. the English national vegetable. Eat your heart out Nigel Farage, those perfidious Europeans have triumphed again. To misquote American radical journalist Lincoln Steffens’ famous aphorism after his visit to the Soviet Union in 1919 (he later recanted). Last year when writing my Cowley Road Cookbook I forecast that the next big global trend to hit the Cowley Road food scene would be insects. 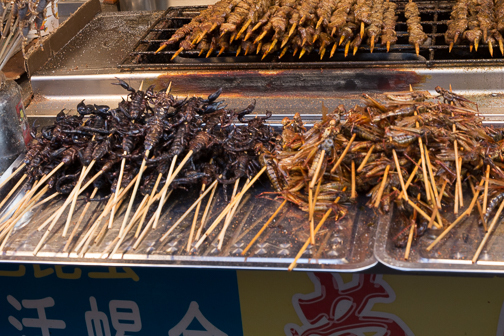 Two billion people world wide are eating insects as part of their normal diet already, and I speculated that the arrival of entomophagy on Cowley Road couldn’t be far away. 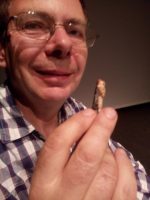 And sure enough Science Oxford hosted a bug banquet at the Pegasus Theatre over the weekend. Two in fact. Some twenty two people paid to come along, about half were children. Quick quiz. 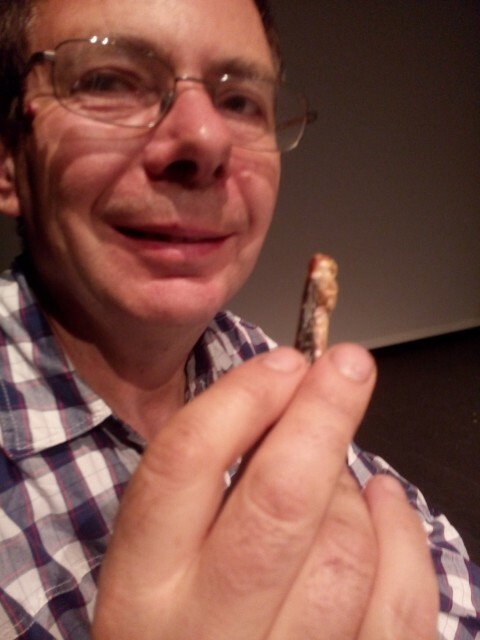 Who had eaten insects before? Only two hands went up, mine being one. Where? ‘In China.’ we both said. And off we went. Starting with a short video from the BBC’s Living Planet series on children catching and eating tarantulas in the an unspecified jungle location. The size of dinner plates they say. Cook them over an open fire until all the dangerous hairs are burnt off and ‘they taste like crab’ – apparently. Back at the Pegasus nothing so ambitious. 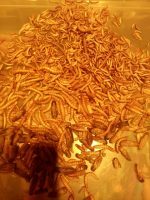 Actual cooking was out for a start, but we were served up with a kind of ‘tasting menu’ of little creatures; mealworms, (see picture) grasshoppers, ants, silkworm pupae, crickets and locusts. 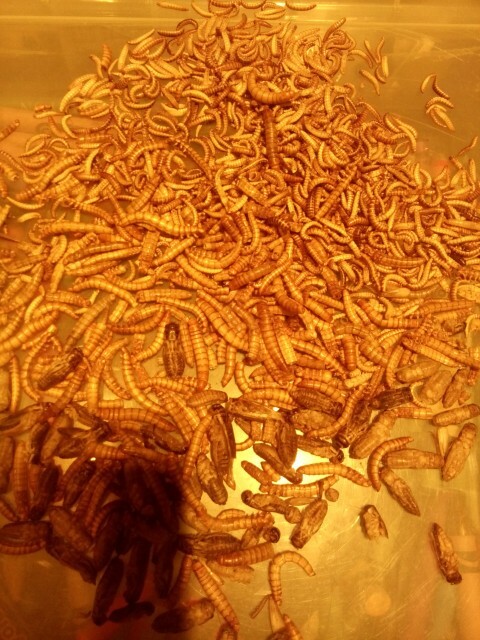 To be honest the mealworms taste like pringles; the crickets are better, a sort of coconut chip flavour, and the locusts are by far the most interesting; slightly fishy, crunchy, but the wings are a bit chewy. Yes that’s me eating one. Being mainly aimed at children, presumably on the ‘get ’em young’ principle, the next part of the event was so so British it couldn’t be parodied. Cooking in a theatre? Never. ‘Elf and safety of course, but the Science Oxford team produced a tealight, some rubbers to balance it on and a little stand to to put your aluminum cupcake on for each table of excited adults and children, and it was the opportunity to melt some chocolate, throw in some dried berries/meringue pieces/candied cherries and your insects of choice. Locust dipped in chocolate anyone? It worked for some. To round off was the ‘something I prepared earlier’, slot. Bug baking in all its glory. We got to sample huge platters full of banana bread …with added mealworms, chocolate truffles … with grasshopper, white chocolate fudge and ants, and my favourite, ‘chocolate chirp cookie’ with cricket. All very sweet, in both senses of the word. Next time something a little more spicy with a beer, like these ones in Beijing, perhaps. A few weeks ago I took a trip down to Camberwell in south east London to see my daughter on her birthday and visit her new flat. On checking the map and tube links I realised that one of the quickest ways to get there was by tube to Oval and then walk. The walk took me right past where I used to live in the 1970’s , the Brandon Estate in Walworth. I lived there from 1977-79 on the fifteenth floor of one of the massive tower blocks, Prescott House. By and large the experience was positive; the flat had fantastic views, was roomy, warm and quiet. I enjoyed the proximity to central London and got stuck into community politics including being co-editor of a fairly scabrious magazine ‘South Circular’, and secretary of my local Labour Party branch. Nonetheless the area then was very far from gentrified, and suffered from the attentions of the National Front. Indeed the only reason I and my flatmate got such a GLC flat in the first place was because it was ‘hard to let’. But it had a balcony on which we grew tomatoes in a gro-bag, and we had a Henry Moore in the garden. Yes really. In fact it was and still is, ‘Two piece reclining figure no3’ (1961). I remember being very struck by it; when we moved in the lifts didn’t function. It was half way through a protracted lift engineers strike so I had plenty of opportunities to view it from various heights and angles as I toiled up and down those fifteen flights of stairs. The idea of a Moore sculpture in such a location was very much part of the post war approach to planning and community building. As well as three enormous tower blocks, the estate, designed by William Morris fan Ted Hollamby (so much of a fan indeed that he bought and lived in the Red House in Bexley, William and Jane Morris’s first house), included a range of modern streets, some older renovated ones, a church, pub, shopping centre, community hall and library. And that sculpture. Which was complemented as I recall, by a giant totem pole for in the centre of the children’s playground. The LCC was in the habit of commissioning such art works as the centre-pieces of its estates, but this one was which was installed in 1962 when the estate was completed, was at £8,000 by far the most expensive commission they had undertaken until then. Indeed Ted Hollamby was reportedly pretty annoyed as the shopping centre included a mural of the the Chartists meeting at Kennington on 10 April 1848, designed by him, which basically only got a fraction of that sum allocated for materials and installation. Moore liked it and spent quite a bit of time coming up with different options for its installation. In an interview in Atlantic Monthly the year after its installation he said: ‘I realised what an advantage a separated two-piece composition could have in relating figures to a landscape. Knees and breasts are mountains.’ Almost forty years after I was living on the estate, the sculpture is still there and looking just as impressive as I walked through it in the gloaming of an early Spring evening. It made me realise that I still hanker after having a Henry Moore in my garden again. In the 1770’s when the New Town was built to the north of the Old Town in Edinburgh, there was a mass movement of people from Old to New – abandoning the insanitary courtyards and tenements of the medieval city for the glories of the new Georgian squares and circuses. It was known as ‘the great flitting’. It is hardly on the same scale, but this weekend saw my great flitting. After 28 years on my allotment plot I moved. Call it downsizing, call it pragmatism, even the effects of getting older perhaps. But having a garden, an allotment down to fruit trees, and another for vegetables, as well as a share of a poly tunnel, was beginning to feel like too much. After all, daughters flew the nest some yeas ago, partner Sue has her own allotment in Bristol, which I also loyally help with, and the plan is to spend more time growing veg in the garden. So that veg plot was beginning to look like outdoor housework – or at best, a way of growing far more than I could possibly consume, and then wondering why I did it after giving three quarters of it away (pleasurable thought that can be). Decision made last autumn, to consolidate on just one plot – the orchard. Making the move will take time. The orchard is mass of trees (!) and a lot of grass between them. A couple of years ago the City Council, after pressure from plot holders because of repeated flooding of the site, spent time laying drainage pipes (see my blogs on the susceptibility of my old plot to flooding, and the councils work on the orchard one). They go right across my orchard plot and in doing so took out most of the hedge. So now there is much more space; space where the hedge was and space opened up between the trees, space to dig and turn into a series of mini plots, just right for the fugitive veg. Digging out the remaining hedge roots, the ivy all over the ground, and prepping up new beds is the really time consuming bit, but progress is being made. 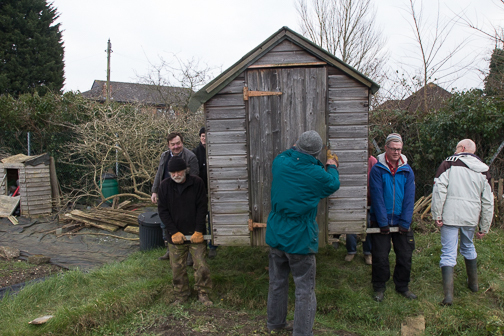 The symbolic moment to is that move of tools and equipment from one plot to the other – and the shed to put them all in. In the USA there is a tradition of the whole village turning out to assist in the local farmers ‘barn raising’. A couple of blokes can never do it on their own, it is a communal effort, with much merrymaking at the end of a hard days work, and a farming family standing proudly in front of their new barn. Here its much the same if on a smaller scale. So come Saturday, the allotment association work party gathered, the shed assessed, carrying poles rustled up and the work began.The shed is over 40 years old. They made ’em different in them days. None of this flimsy planking held together with glorified staples. 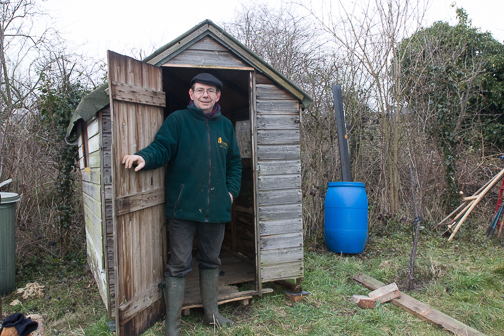 This shed is solid – it has survived several moves since I acquired it, second hand, in 1980. So first reactions of the ‘Oh, I think we can manage this with four’, one person at each corner, soon proved wide of the mark. In the end it was eleven; six on the three steel poles, two more front and back, and one out front (not me) issuing instructions and clearing a safe path. All in all it took about 30 minutes to move first the base and then the superstructure and put the back together 300 metres away on the new plot. Incredibly the shed was so sturdy and the move so careful, that when the superstructure was gently laid back on the base, the screw holes for the metal brackets slotted straight back. It could all be screwed back together using the same screws. Result: barn raising allotment-style achieved. Thanks friends and fellow plot holders. Come a summer evening, the drinks are on me. It is that time of year when New Years resolutions are made and broken. I know this because the yoga class I go to is always packed out in January. It thins out by mid-February though. Also there are lots of books published around Christmas which have an agenda – to make the reader ‘do something’; take up a new past time, de-clutter, or this year’s hit … be mindful. So ‘The Ladybird Book of Mindfulness’ seemed the obvious place to start. ‘Muck and mindfulness’ … has a ring to it; might be a good title for a blog some day. Amazingly my alter ego, Martin features heavily in this book. ‘By practicing mindfulness, Martin has found his inner peace, even though he is being kidnapped by swans.’ Exciting thought, and there is even a lovely picture of Lord Muck on some kind of throne heading skywards with a flock of swans clutching silken ropes in their beaks. Other parts of the book are a bit darker. ‘Clive likes to practice loving kindness meditation…Clive finds this easier than bothering to meet his friends or lend them money.’ Even more alarmingly, ‘Mindfulness has taught Leanne to accept things as they are; rubbish, expensive, unfair and out of date every six months.’ That sound suspiciously like a description of a new years resolution to me. So does mindfulness involve buying lots of soon to be out of date stuff? All those colouring books, relaxation tapes and tracts on how to be mindful. Well yes…the implication is that purchasing them and retiring to your room to spend time with them is the path to something sacred and special, unless that is, you can afford to retire to a mountain top to practice, which is even better…. and even more expensive. All very West Coast/Marin County; something I satirised in ‘Spilling the Beans’, some 30 years ago. It is the notion that you need to ‘find time’ to meditate that really grates. Usually that actually means stopping looking after the kids or something else you want to duck out of. Not being one for the sacrilising approach, my ‘mantra’ for the past few decades has been ‘the meditation of every day life’. And what pray does that mean when its at home? Well, speaking of home… doing the washing up, cleaning the hens, hanging out the washing (my favourite, on a warm spring day… nothing better) hoovering (there is a certain strange joy to hearing those bits of dirt rattling up the nozzle and into the bag) and putting all the kitchen waste onto the compost, knowing that without doing a thing, it will be ready to spread round those vegetable seedlings in three months. That’s the joy isn’t it, knowing that you don’t have to do a thing – sun and wind will dry the washing and worms and insects will do their composty bit. As the Buddhist saying has it; ‘Don’t just do something; sit there’. I had a real pre-Christmas treat visiting my eldest daughter and her partner in Edinburgh. 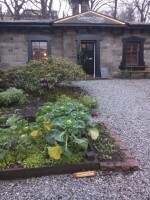 Living in the New Town just below Calton Hill, their neighbourhood restaurant is somewhere called ‘Gardener’s Cottage’. 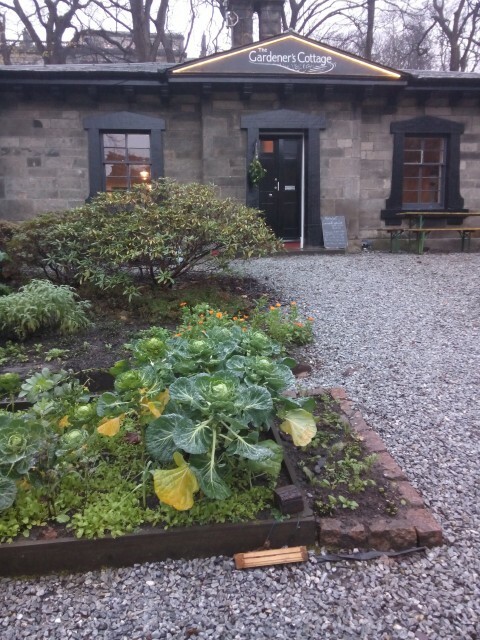 Like the rest of that part of the New Town, said cottage was built in 1836 by William Playfair and is located in Royal Terrace Gardens, where unsurprisingly the original purpose of the building was to be … the gardeners cottage. The gardens still look great, but they are maintained by Edinburgh Corporation these days, and the cottage was for many years abandoned and in a ruinous state. Until a few years ago when the council reckoned that really it ought to be demolished, but as it was a listed building, it couldn’t be. A competition for a new use; and the winners were a couple of chefs Dale Mailley and Edward Murray who opened their new restaurant in 2012. It was an immediate hit with the critics and the locals. The concept is simple. Very simple. Three trestle tables seating 10 each, one in a small room and the other two in the main dining room which has the kitchen off it – no larger than many household kitchens. 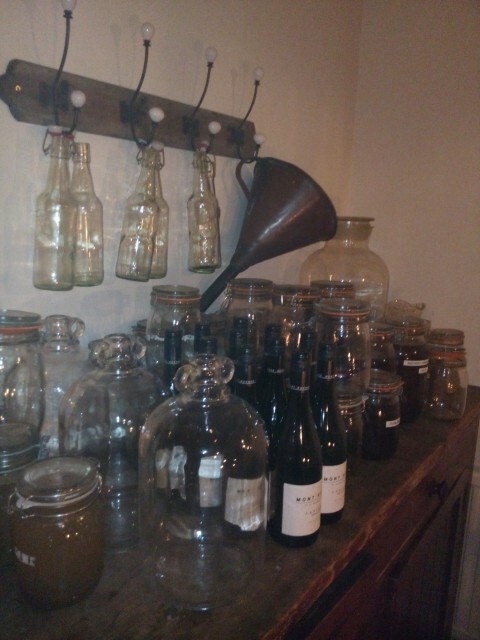 The Lord Muck party end up in the wee room, whitewashed walls, and dressers piled high with jars and bottles; ‘Rowan jelly 5 October 2015’, ‘Plum jam 2 October 2015’, ‘Beetroot kvas 25 may 2105’, ‘salted pears’… artfully artistic meets practical. 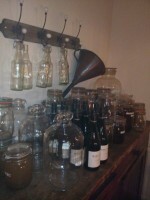 The entrance lobby is just the same, rows of neatly shelved and labelled bottles and jars. The trestle tables are bare and the candles are in pewter candlesticks. The apogee of hippy sophistication. The tables lend an up close and personal dimension to the dining experience too as diners share space and condiments – and even the occasional alcoholic top-up. And .. the food. It is rather wonderful to walk up the short gravel path to the restaurant between rows of home grown veg, right there in the city centre. Brassicas, salad crops, and herbs all very much in evidence. Some serious cultivation – in December. The menu reflects this, local, seasonal, home grown, quite a bit of foraging nothing remotely ‘sourced’ from a catering wholesaler. Not much in the way of choice, but flexibility for vegetarians. A ‘tasting menu’ approach, so seven courses served (there was a little bit of nervousness about quantities from one member of the party, and jokes about will we need to stop by for fish and chips on the way home.. all entirely unfounded); oyster tempura to start, something fairly amazing with mushrooms and crispbread, a serving of hake with kale leaves (almost certainly from the garden) and slithers of potato, a ‘cheese course’ consisting of whipped goats cheese served up in a tiny cornet made from ‘ground burnt leek’ with a piece of toasted beetroot as the ‘flake’, poached pears and chestnut with ice cream dessert. Mind you, serving up a dish with Jerusalem artichokes as its base, is a recipe for distinct indigestion. The drinks menu was a masterpiece of inventiveness including a local micro- brewery beer, ‘fig pucker’ (think David Cameron’s student exploits…. actually no, don’t) and something stronger, brewed with local foraged berries; the makers of both known personally to other members of the Muck party. 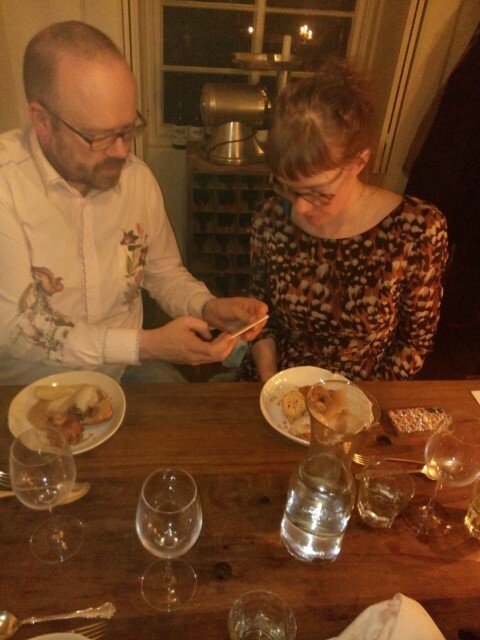 Ours was a late evening booking so by the time the ‘petit fours’ had been consumed it seemed wiser to retire back to base and drink our own Calvados. But what a spot, an island of simple sophistication in what can be a pretty crazy city. For me, two books published this year have taken different and inspiring approaches to the weather and the outdoors. As we watch water cascading down the very streets in Yorkshire that the British leg of the Tour De France traversed just last year, Jon Day’s Cyclogeography: journeys of a London bicycle courier (Notting Hill Editions) chronicles the unforgiving nature of the messengers existence on the fringes of society, while at the same time examining the physical dimensions of the journey itself; gradients, road surfaces, wind, rain and the way the bike wants to flow down hill following the ancient ley lines of the city’s subterranean rivers. Alexandra Harris, Weatherland: writers and artists under English skies (Thames & Hudson) is an ambitious literary and cultural history, the story of the stories that people have told each other about the weather across the millennia from Anglo-Saxon scribes to Virginia Woolf and Zadie Smith. As the weather we have associated with the British Isles begins to change irrevocably, she reveals the great storehouse we carry in our minds; the names we find for the hail, the wind and the mist, the traditions of the seasons, the Frost Fairs and the riddles. A shorter version of this blog first appeared in the review section of The Guardian on 26 December 2015. American artist Theaster Gates sprung to peoples notice with his work on urban regeneration-meets-art projects on Chicago’s South Side. Since then he’s worked in Istanbul and Kassel, Germany amongst other places. 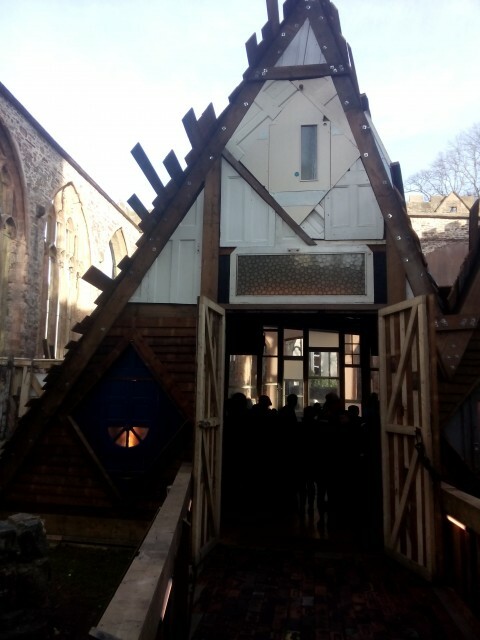 In November he staged ‘Sanctum’ in a ruined church in Bristol. The Temple Church has been left unrestored since it was destroyed in the Blitz in November 1940. 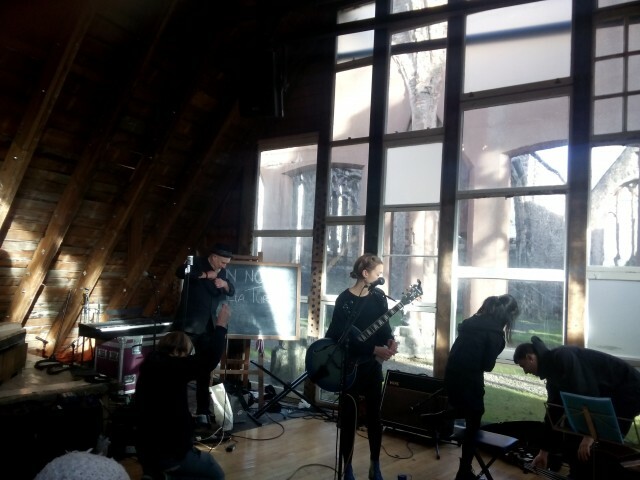 In ‘Sanctum’, Gates created a performance space inside the shell of the church, a space that hosted 24 days of music, song, and spoken word, 24 hours a day. And what a space it is. 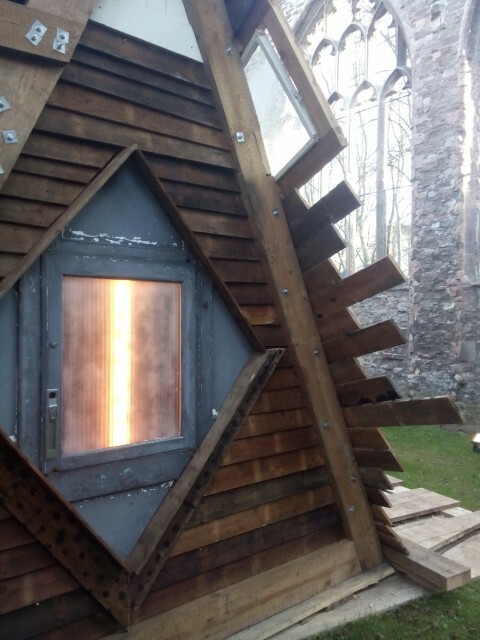 Built from salvaged beams, old bricks, 18c floor planks and old doors and windows; it is part Hobbit home, part inverted wooden ship and part gigantic allotment shed. Lord and Lady Muck and friends got to visit on the afternoon of the final day. A beautiful, sunny, and cold day. The church itself, hardly ever open to the public – some of the structure isn’t safe, is a bleak reminder of the horrors of war visited upon a city that suffered more than its fair share of bombing 75 years ago. Inside, Gates has created something both provisional and eternal, turning dead space into something alive. Alive that is with the continuous performances. It is all a bit chaotic – as it should be. Admission is free so just turning up and queuing is how it works – probably not much of a queue at 5am on a weekday morning, but what unexpected joy might there be then? A harpist perhaps or a singer. Turning up at any time it could be a ‘famous name’, (Mercury Prize nominees Slaves appeared at one point) or more likely a mash up of Bristol bands and singers, poets, speakers, or performers. You can stay for an hour, and groups are admitted at 20 minute intervals at busy times, leading to a sense of the sea, as a gentle tide of people empty and fill the space as their time-slots commence or expire. The space is small, welcoming and flexible. Bristol-based singer Julia Turner was on to entertain the Muck party, with her fellow performer violinist Annalise Lam. ‘Girl with a trumpet’ was one of their star turns (you can check out the actual performance on You Tube) and they performed a couple of Bill Withers numbers too (as in, ‘how do you turn in a duck into a great blues musician?’ ‘You put it in the microwave till its bill withers’) but the one that touched our hearts was ‘My Victorian boy friend’. Meantime children played on the wooden structures that cover the stones that mark the remains of the original 12c Knights Templar church and we gazed in awe at the quality of the workmanship that went into the construction of this supposedly temporary venue. A temple to allotment sheds world wide, right there in the Temple Church. 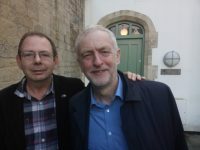 As the political class digest the implications of Jeremy Corbyn’s landslide win in the Labour leadership elections it seems appropriate to remind ourselves of the importance of his allotment in his political trajectory. Throughout the leadership election campaign Lord Muck was reminded of our similarities: ‘..but Martin he rides a bike, makes jam, and has his own allotment!’ What is this supposed to tell us? That Lord Muck should lead the Labour Party? No thanks. Instead let us turn to the real story. Jeremy Corbyn’s allotment. The media has made a few passing and often dismissive references to the allotment – mostly of the ‘well he can always retire to his allotment if he loses’-type comments. He didn’t lose, so now the allotment assumes a much greater political salience. Of course we have been there before – in fiction. Remember Chance, the Peter Sellers figure in the film ‘Being there’? The humble gardener who who determines Presidential policy in the White House, on the basis of his observations about the weather and the seasons. Now we have the chance to watch nature imitate art. But back to that allotment. Where is it ? In East Finchley, north London. How long has he had one? About twelve years; to be precise since March 2003. 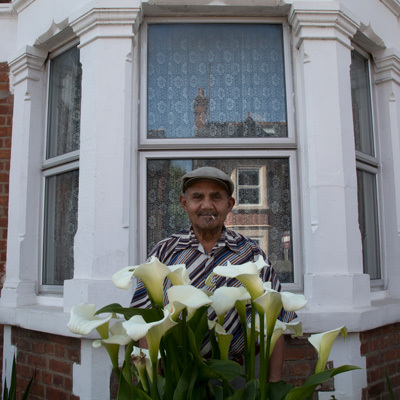 Apparently his name came up on the waiting list a week or so before the invasion of Iraq – so that spring planting and digging season got missed. Most important, what does he grow? 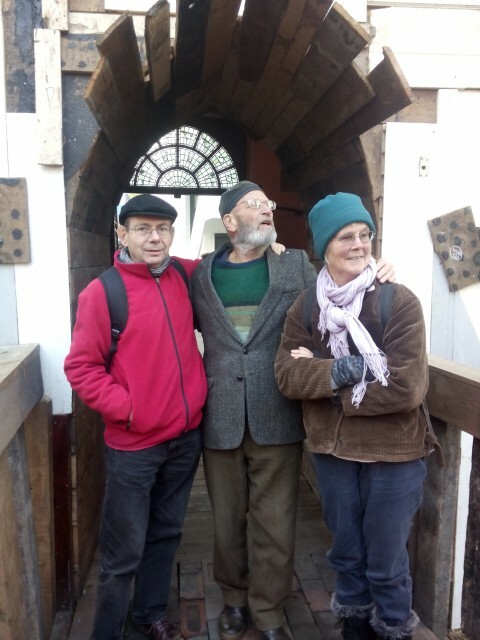 According to an interview in The Independent on 9 August – the only interview to take his interest in allotments seriously, this year he is growing potatoes, beans, soft fruit and apples. Good choice. Its been a great year for all of them. The Indy quotes his gardening style thus: ‘I try to grow things that don’t require a lot of watering because I don’t get up there regularly enough. But I always make time for my allotment. You like a dry summer because the weeds don’t grow. You water what you need to water and the weeds can sod off.’ For a busy gardener its a technique that works – most of the time – as long as you don’t want to grow anything like lettuces. But then he is clear he doesn’t. How has it influenced his policy positions? This still remains to be seen but he has argues that Labour should build houses with gardens for everyone so that ‘anyone who wants to be a beekeeper should be a beekeeper’ (his environment policy is strong on protecting bees). I don’t recall that as being the wellspring of previous Labour housing policy. And the jam? 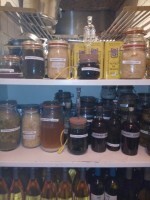 In an interview in the ‘Sunday People’ he refers to making ‘apple and blackcurrant jam’. Figures; he has already told us about the apples and soft fruit. So come on allotment holders of the world, Unite! Demand the impossible of Jeremy. More roses! Anyone who has spent time on an allotment will immediately relate to that and to the photos themselves: beehives weighed with pudding stones tilt amongst the sunflowers on a rooftop, a grey haired Armenian woman poses in a orchard clutching her scythe, while thousands of miles away a man in his fifties sports a ‘Bronx chicks rule’ rubber apron and relaxes in a plastic chair beneath a leafy bower. Brykcznski himself lives on the third floor of an apartment block in Warsaw and as he puts it; ‘My feet get to touch real earth just once a year during a two week holiday. I have a deep feeling that there is something wrong about this and that I’ve been cut off from my roots…’ From this came the idea of this book watching planes come into land above the allotments near his apartment and realising that through them people were fulfilling the same need that he had for contact with the earth. Burnside was drawn to the book – as indeed I have been, not just by a marvellous collection of images – something I aspire to emulate both as gardener and as photographer, but also because of its prophetic nature. As he puts it: ‘How we live with the natural world, the green world, the animal, the weather, the elemental is surely destined to change as the soi disant developed world collapses around its own greed and arrogance.’ It might sound a depressing subject for an abjectly rainy summer weekend, but the spirit that comes from this book warmed me, and as I looked out of the rain-spattered window made me realise that the rain is only doing those green spaces we cherish, good.